Maybe it's overuse due to my chronic knitting habit, my obsession with making homemade bread (kneading is hard work! ), or maybe it's the damp west coast air that chills my bones. 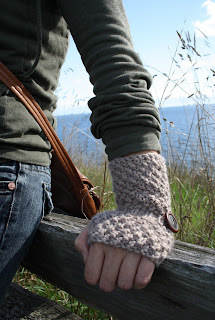 I know it's partly because I spend more time than I would like at the computer... Whatever the reason my wrists and fingers are always cold and achy and I've been dying to whip up some wrist warmers for those long stints on the keyboard and to wear outside during this transitional season when it's not quite cold enough for gloves. I really wanted fingerless mitts that featured a button. I remembered a pair of fingerless mittens I knit last winter, I made them nice and long, the only trouble was they got all bunched up when I would put them on after my coat. 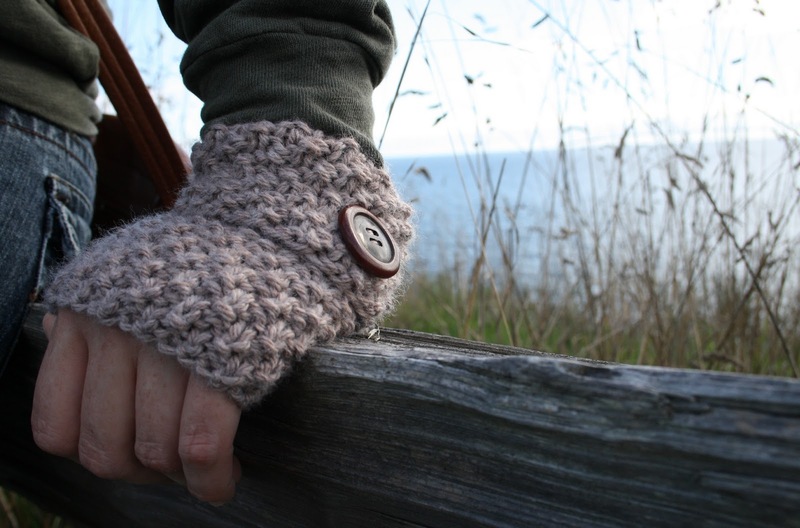 With the new design, instead of leaving the wrist button to be purely ornamental, I've added a buttonhole so that these fingerless mitts can morph into a mitten cuff. 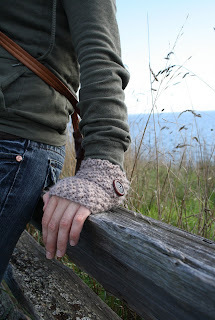 I didn't really think much of these mitten cuffs other than they filled a need (and my wrists are very happy for that), but when I wore them out for the first time I got so many compliments on them, I was thrilled! My inspiration for the hair-do came from a picture on luvinthemommyhood's blog, a Weekend Wishes post... thanks for the inspiration Shannon! love the stitch patterns on the new mitts! Those are gorgeous! I love the texture, and the button is the perfect detail. Your hair looks gorgeous!!!!!!!! Love them as much as i love the cuffs!!!! Wanna do a tradesie? My needles are itching to make these up my dear! This is so awesome. I superlove it. You rule! These little gloves are adorable and I love your hair! I most definitely need to figure out how to do mine like that!